Stock markets around the world shrugged off the results of the US midterm elections that left Congress divided but delivered little in the way of surprises. 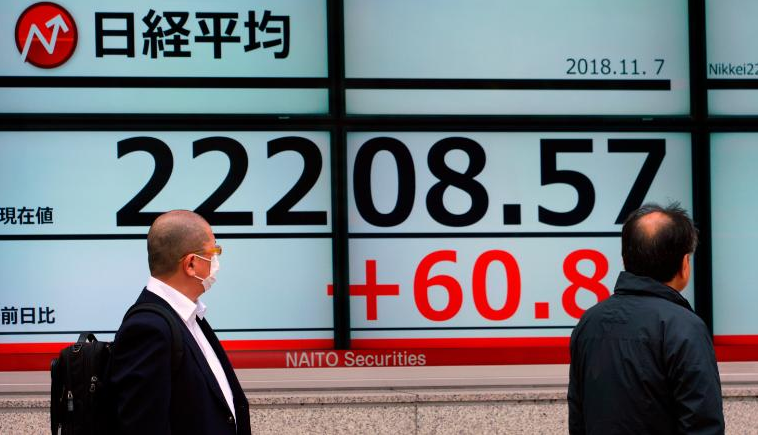 There were modest losses across much of Asia, with Tokyo’s benchmark Nikkei index and the Shanghai Composite ending 0.3% and 0.7% lower on Wednesday. But European markets opened higher. London’s FTSE 100 index, Germany’s DAX and France’s CAC 40 all gained about 0.9% in early trading. US futures were indicating a positive start to the day on Wall Street. The elections are shaping up to have significant political consequences for the world’s largest economy. Democrats are set to win a majority in the House of Representatives while Republicans retain control of the Senate. But investors are not betting on a dramatic change in policy. “I don’t think the outcome is a big surprise,” Larry Fink, the CEO of money management firm BlackRock, said Wednesday at a Bloomberg business conference in Singapore. Markets suffered “a big setback” in October and are now “trying to restabilize,” Fink said. Digesting the results of the midterms “will be part of that restabilizing process,” he added. Investors are bracing for a period of gridlock in the United States, with neither party likely to be able to enact sweeping legislation. While that may mean Republicans and President Donald Trump fail to cut taxes further, it also means the current tax cuts can’t be rolled back. The elections are “unlikely to bring any near-term policy shifts,” Richard Turnill, BlackRock’s chief global investment strategist, wrote to clients ahead of the results. The main US indexes had closed up just over 0.5% on Tuesday as voters went to the polls. With Congress divided, America’s fiscal, regulatory and monetary policies will likely stay the same. Investors typically don’t mind gridlock, cynically figuring it means Washington can’t mess anything up. “We see few sustained market implications if the midterms result in a divided Congress,” Turnill wrote. But too much gridlock can also be a bad thing, as demonstrated by the debt ceiling stalemate of 2011 that caused an unprecedented credit rating downgrade. “Expect fiscal deadlines to become more disruptive,” Goldman Sachs analysts wrote in a report this week. Others see potential upsides from the election results. David Rubenstein, the billionaire co-founder of private equity firm The Carlyle Group, pointed out that the US economy often performs well when control of Congress is split between Republicans and Democrats. Congress may also now push the Trump administration to try to end the trade war with China. They “will try and see if they can get some arrangement with the Chinese that brings some resolution,” said Rubenstein. The midterm results spared investors the shocks of the US presidential election and Brexit referendum in 2016. Both surprise events sparked dramatic reactions in markets. Stock futures initially plunged the night of Trump’s election, before rebounding and closing with a resounding gain.